New ILO Member Serving Haliburton Coming Soon! The seasons come and go but the dangers that accompany them are all the same. From black ice on the highways and record high snowfall to slip and falls and motor vehicle accidents; it is very easy to get injured during this and any other season. For Haliburton and area residents who were seriously injured in an accident, the Injury Lawyers of Ontario (ILO) law group offers vast experience and knowledge of Ontario Personal Injury Law and can represent you in your right to compensation. The Haliburton Highlands boasts a unique wealth of natural beauty, freshwater lakes, forests and extensive trails. The many recreational opportunities in this region provides residents and visitors with a myriad of activities, but also heightens the risk of recreational accidents. For example, in a recent snowmobiling accident, a 22 year old man was killed when he flew off his snowmobile and hit a tree. Unfortunately, accidents are not confined to Haliburton’s winter season. A three year old was fatally wounded while riding on an ATV with his father in the Kennisis Lake area in Haliburton County. The road they were travelling on at the time was not one of the usual routes traversed by ATVs and when they came up over a hill, there was a chain between two trees that was not flagged or marked. Unaware of this, they drove straight into the chain. The adult male driver suffered non-life threatening injuries but sadly, the child did not survive his injures. Investigation determined that the driver was not speeding or drinking at the time of the accident. Not reported was whether either of the occupants was wearing helmets. A representative from the Haliburton ATV Association released a statement reminding everyone of the safety measures required by law when operating ATVs, which include wearing approved helmets and not driving on main roads. In another recent accident in the Haliburton area, two motorcyclists were involved in a crash with an SUV, killing a 37 year old motorcyclist and injuring the other two drivers. Whether you or a family member has been hurt in a vehicle collision, recreation accident or something as innocuous as a slip and fall, you should contact a personal injury lawyer at the Haliburton ILO law office. The ILO group has skilled and experienced lawyers in communities throughout Ontario. 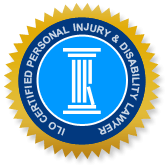 We offer personal service to our clients, and our knowledge and expertise in handling these kinds of cases in and out of the courtroom will help you get the deserved compensation for your injuries. Your first step should be to seek medical attention to assess the severity of your injuries and needed medical treatments. If injuries appear to be severe and permanent, contact us as soon as possible to begin the claims process. Visit us online, in office or fill out a free online form and begin the recovery process with the peace of mind in knowing that you are in good hands.